What a precious little boy and very smart too. Master Commandant Richard Somers will have to wait a little longer to come home, if it happens at all. I am so disgusted with John McCain and his daughter as well. The two of them can go jump off a high bridge. 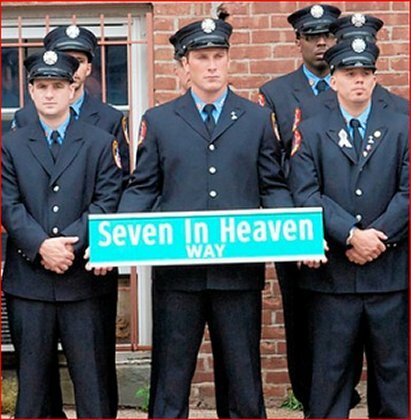 The street, "Seven in Heaven Way," was officially dedicated last weekend in Brooklyn outside the firehouse where the firefighters once served. The ceremony was attended by dozens of firefighters, city leaders and widows of the fallen men. "There should be no signage or displays of religious nature in the public domain," said Ken Bronstein, president of New York City Atheists. "It's really insulting to us." 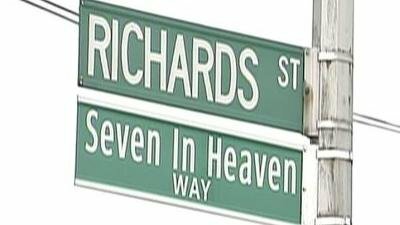 Bronstein told Fox News Radio that his organization was especially concerned with the use of the word "heaven." City leaders seemed dumbfounded by the atheists’ outrage because no one complained about the sign as it was going through a public approval process. “It’s unfortunate that they didn’t raise this as an issue while it was undergoing its public review either at the community board level or when it came before the city council on their public agenda,” said Craig Hammerman, the district manager for Brooklyn Community Board Six. Thank you God for these Heroes, these 9/11 Firefighters. I will stand by this (and we have all heard it before).......There are no Atheists in Foxholes! The nuclear-powered aircraft carrier USS Ronald Reagan arrived off the coast of Japan Sunday to support Japanese forces in disaster relief operations, the U.S. Department of Defense said in a statement. The city﻿ seems to be so silent and suddenly a big wave is coming up, unbelievable. The power of water is incredible. May God be with Japan. The U.S. military rerouted several ships toward Japan on Friday and began preparing for humanitarian missions in the wake of a devastating earthquake and tsunami that left at least hundreds dead. Private U.S. aid groups began collecting funds and, in some cases, preparing emergency supplies. But experts said that Japan would probably not need the kind of massive support that poor countries such as Haiti require after a crisis. Japan has one of the best government disaster-response agencies in the world, with long experience in recovery from earthquakes. Still, President Obama said he told Japanese Prime Minister Naoto Kan that the United States was ready to help. "This is a potentially catastrophic disaster, and the images of destruction and flooding coming out of Japan are simply heartbreaking," Obama said at a news conference. 'Most difficult crisis' since WWII " said Japan's prime minister . God help our amazing troops in their mission of mercy. The Salvation Army is already there and also asking for help. Maurice Strong and George Soros Owners Of Their Puppet Barack Hussein Obama All 3 Set To Destroy America! It is both power lust and an all-consuming hatred of the United States of America that elevated this deadly duo to ogre status. Fortunately for all of those searching for answers, much of their plan for the world, post November 4, 2008 is already mapped out in writing. Leading economic experts and Strong agree that in 2012 people will be going hungry. “Strong has worked diligently and effectively to bring his ideas to fruition, He is now in a position to implement them.” (Henry Lamb, The Rise of Global Governance, available at soverignty.net). “His speeches and writings provide a clear picture of what to expect. In 1991, Strong wrote the introduction to a book published by the Trilateral Commission, called Beyond Interdependence: The Meshing of the World’s Economy and the Earth’s Ecology, by Jim MacNeil. (David Rockefeller wrote the foreword). Back to how to how ogres Strong and Soros, along with others, were able to hijack a world economy. 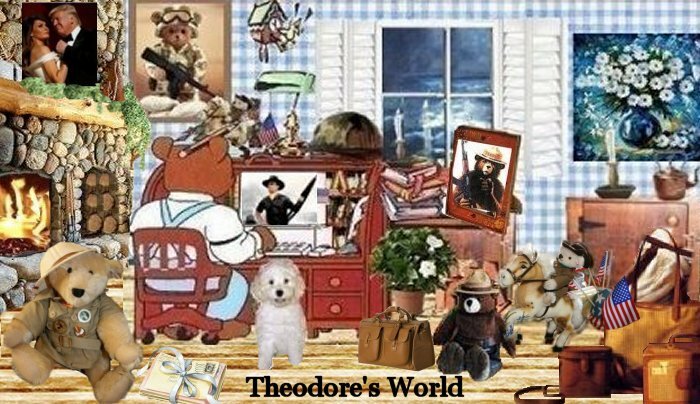 Bloggers and website owners may recall how the Ohama campaign team seemed to have thousands of volunteers available with G-Mail accounts to send out a barrage of nasty letters any time a blog or website asked too many questions or dared to criticize “The Messiah”. In a post January 20 world, it seems that Obama will develop his activist base from within the White House. Maurice Strong has had a longtime influence with the major Foundations, which provide the funding for NGOs, and he has influence with the major international NGOs that coordinate the activities of the thousands of smaller NGOs around the world. Small wonder that Strong spends his time far away in Communist China these days. But there is a silver lining to be found even with the darkest of storm clouds over America and something for Americans to contemplate over the upcoming holidays. In spite of the hype coming out of the Office of the President-elect, Obama is merely a fop for the global elite. He is their, and not the people’s true agent of change. The January 20 inauguration with its promise of 5 million observers in Washington, D.C. will be the extravaganza of a lifetime, deepening recession notwithstanding. It is Obama’s job to demoralize the 58 million people who did not buy into his campaign and for all of those who do not want One World Order. Starring among all the glitterati at the Inauguration Ball, Barack and Michelle are like the stick figures from a kindergartener’s drawing, for this is an emperor who truly has no clothes. Maurice Strong, the Father of America’s destruction . George Soros and his Canadian sidekick, Kyoto architect Maurice Strong, are the brains behind the likes of Al Gore, Mikhail Gorbachev and Barak Obama, all who belong to the above and the “Chicago Climate Exchange” which will make billions on climate change. We already know from the Internet that Soros has gone a long way to bankroll Obama’s campaign, but not so well known is that Soros worked in conjunction with Maurice Strong . Maurice Strong, born in Canada, lived in New York, and now exiled in China, but still the power behind Obama and the liberal House and Senate of America. I can't believe that Agenda 21 is actually on the US STATE DEPARTMENT WEBSITE. When I saw that the other day I was sick the whole entire damned day. This is our David and Goliath moment, we need to hit this giant government, New World Order, between the eyes. A little about ....AGENDA 21. Agenda 21 is a United Nation’s game plan for a radical transformation of the global society. At the Rio Earth Summit, Al Gore stated that “Americans are going to have to face a wrenching transformation of Society.” President Obama’s stated goal is a “transformation of America” as we know it. The innocuous term used by the United Nations to accomplish this transformation is “Sustainable Development.” Broken down, that means the dismantling of America as a sovereign nation and the globalization of our economy and our laws. Our rate of development, according to globalists, is “un-sustainable” based on underdeveloped countries. In effect, it restricts population and economic growth in America through government-controlled health care and through decreased and redistributed resources such as energy and wealth. Americans should no longer “sustain life” of the very young or elderly or remain sovereign and prosperous. The globalists’ creed is – the planet cannot endure it. Progressive politicians on both sides of the aisle have signed on to Agenda 21’s “Sustainable Development.” Obama’s health-scare will have a vice-like grip on who gets medical care – who lives or dies, whereas Cap and Trade, that Obama so desperately wants, will allow the government to have a vice-like grip on how Americans live. The decision closes the book on one of the major lingering investigations into the counterterrorism policies of George W. Bush's administration. President Barack Obama campaigned on abolishing the simulated drowning technique of waterboarding and other tactics that he called torture, but he left open the question of whether anyone would be punished for authorizing such methods. An initial review by the Justice Department's internal affairs unit found that former government lawyers Jay Bybee and John Yoo had committed professional misconduct, a conclusion that could have cost them their law licenses. But, underscoring just how controversial and legally thorny the memos have become, the Justice Department's top career lawyer reviewed the matter and disagreed. "This decision should not be viewed as an endorsement of the legal work that underlies those memoranda," Assistant Deputy Attorney General David Margolis wrote in a memo released Friday. Margolis, the top nonpolitical Justice Department lawyer and a veteran of several administrations, called the legal memos "flawed" and said that, at every opportunity, they gave interrogators as much leeway as possible under U.S. torture laws. But he said Yoo and Bybee were not reckless and did not knowingly give incorrect advice, the standard for misconduct. The Office of Professional Responsibility, led by another veteran career prosecutor, Mary Patrice Brown, disagreed. "Situations of great stress, danger and fear do not relieve department attorneys of their duty to provide thorough, objective and candid legal advice, even if that advice is not what the client wants to hear," her team wrote in a report that criticized the memos for a "lack of thoroughness, objectivity and candor." The internal report also faulted then-Attorney General John Ashcroft and then-Criminal Division chief Michael Chertoff for not scrutinizing the memos and recognizing their flaws, but the report did not cite them for misconduct. Yoo is now a law professor at the University of California, Berkeley, and Bybee is a federal judge on the 9th U.S. Circuit Court of Appeals based in San Francisco. The decision spares them any immediate sanctions, though state bar associations could independently take up the matter. 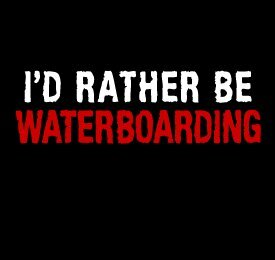 The memos authorized CIA interrogators to use waterboarding, keep detainees naked, hold them in painful standing positions and keep them in the cold for long periods of time. Other techniques included depriving them of solid food and slapping them. Sleep deprivation, prolonged shackling and threats to a detainee's family were also used. Republicans said the memos, authored by two well-respected attorneys, gave the CIA the authority it needed to keep America safe in the panic-filled months after the Sept. 11, 2001 terrorist attacks. Many have criticized the Obama administration for trying to politicize legal advice. "We can only hope that the department's decision will establish once and for all that dedicated public officials may have honest disagreements on difficult matters of legal judgment without violating ethical standards," Bybee's lawyer, Maureen Mahoney, said Friday. Obama has said CIA interrogators who relied on the memos will not face charges for their behavior. A separate criminal inquiry is under way into whether a handful of CIA operatives crossed the line, leading to the death of detainees. The LEFT world will not like the outcome. The Bush administration was already convicted in their minds and all that remained was the jail sentence! “poor judgement” is in the eye of the beholder. I think Yoo’s judgement was exceptional and I applaud all involved for preventing further deaths at the hands of jihadist scum. Especially President Bush and Vice President Cheney. The democrat party and big media has been infiltrated top to bottom by out-and-out enemies of America, and it’s time we realized that we are past the point of politics. We are at war, and the enemy is very much within. Nor was much consideration given to the logical conclusion of all this grandiose talk of global consensus as unquestionably desirable: if there was no popular choice about approving supranational "legally binding agreements", what would happen to dissenters who did not accept their premises (on climate change, for example) when there was no possibility of fleeing to another country in protest? Was this to be regarded as the emergence of world government? And would it have powers of policing and enforcement that would supersede the authority of elected national governments? In effect, this was the infamous "democratic deficit" of the European Union elevated on to a planetary scale. And if the EU model is anything to go by, then the agencies of global authority will involve vast tracts of power being handed to unelected officials. Forget the relatively petty irritations of Euro‑bureaucracy: welcome to the era of Earth-bureaucracy, when there will be literally nowhere to run. But, you may say, however dire the political consequences, surely there is something in this obsession with global dilemmas. Economics is now based on a world market, and if the planet really is facing some sort of man-made climate crisis, then that too is a problem that transcends national boundaries. Surely, if our problems are universal the solutions must be as well. Well, yes and no. Calling a problem "global" is meant to imply three different things: that it is the result of the actions of people in different countries; that those actions have impacted on the lives of everyone in the world; and that the remedy must involve pretty much identical responses or correctives to those actions. These are separate premises, any of which might be true without the rest of them necessarily being so. The banking crisis certainly had its roots in the international nature of finance, but the way it affected countries and peoples varied considerably according to the differences in their internal arrangements. Britain suffered particularly badly because of its addiction to public and private debt, whereas Australia escaped relatively unscathed. That a problem is international in its roots does not necessarily imply that the solution must involve the hammering out of a uniform global prescription: in fact, given the differences in effects and consequences for individual countries, the attempt to do such hammering might be a huge waste of time and resources that could be put to better use devising national remedies. France and Germany seem to have pulled themselves out of recession over the past year (and the US may be about to do so) while Britain has not. These variations owe almost nothing to the pompous, overblown attempts to find global solutions: they are largely to do with individual countries, under the pressure of democratic accountability, doing what they decide is best for their own people. This is not what Mr Brown calls "narrow self-interest", or "beggar my neighbour" ruthlessness. It is the proper business of elected national leaders to make judgments that are appropriate for the conditions of their own populations. It is also right that heads of nations refuse to sign up to "legally binding" global agreements which would disadvantage their own people. The resistance of the developing nations to a climate change pact that would deny them the kind of economic growth and mass prosperity to which advanced countries have become accustomed is not mindless selfishness: it is proper regard for the welfare of their own citizens. The word "global" has taken on sacred connotations. Any action taken in its name must be inherently virtuous, whereas the decisions of individual countries are necessarily "narrow" and self-serving. (Never mind that a "global agreement" will almost certainly be disproportionately influenced by the most powerful nations.) Nor is our era so utterly unlike previous ones, for all its technological sophistication. 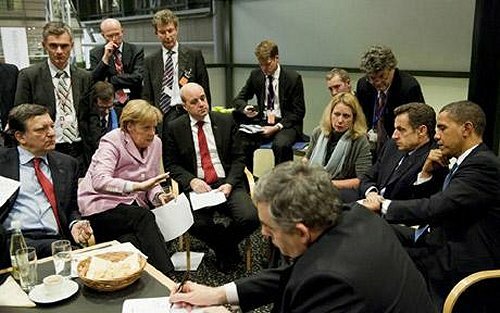 We have always needed multilateral agreements, whether about trade, organised crime, border controls, or mutual defence. If the impact of our behaviour on humanity at large is much greater or more rapid than ever before then we shall have to find ways of dealing with that which do not involve sacrificing the most enlightened form of government ever devised. There is a whiff of totalitarianism about this new theology, in which the risks are described in such cosmic terms that everything else must give way. "Globalism" is another form of the internationalism that has been a core belief of the Left: a commitment to class rather than country seemed an admirable antidote to the "blood and soil" nationalism that gave rise to fascism. The nation-state has never quite recovered from the bad name it acquired in the last century as the progenitor of world war. But if it is to be relegated to the dustbin of history then we had better come up with new mechanisms for allowing people to have a say in how they are governed. Maybe that could be next year's global challenge. "Except in the United States, where it became a very contentious talking point, the US still holding firmly to the 18th-century idea that power should lie with the will of the people." Well it does not seem so lately, not since Obama got elected. Obama and the dems have all been doing things with no concern of what the people want. If it comes to global world government vs the people, I’d vote for bringing back the guillotine. OFF with their HEADS!! The Book of Revelation is quite clear there will be a world government. It may come in a few years or hundreds of years from now but it will come. This has been building and building and growing for the last 50 years, at least, if not longer. So, it's had plenty of time to build and put things and mechanisms in place, plus all the people in place to make it happen. Judges, lawyers, politicians and brain washing in schools in all grades and ages. The march towards socialism, lawless open borders, intentionally flooding the country with millions of illegals and American hating foreign nationals, slanted trade policies, and the distribution of American wealth...the breakdown of our economy and the dollar, is sponsored by both these corrupt party's in D.C.... and has been for many years now. None of this was an accident. I hate having the enemy among us. We all are fighting this as much as we can. I do not intend to roll over. Surf dog Ricochet (Rip Curl Ricki's) inspirational journey from service dog training, to turning disappointment into a joyful new direction, to surfing with quadriplegic surfer, Patrick Ivison, to fundraising for charitable causes. She is currently leading a fundraiser for a six year old boy named Ian who suffered a traumatic brain injury in a horrific car accident that claimed the lives of his parents. 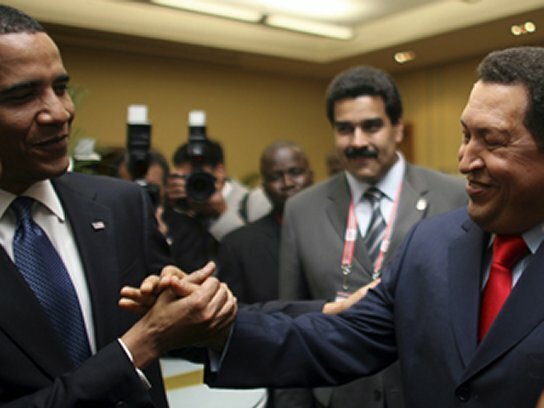 Hussein Obama and Chavez Secret Handshake? Hey, bro, wassup? We cool, yeah, we cool! ( FOX news ) Obama shook hands with Venezuela's Hugo Chavez on Friday at the opening of the Summit of the Americas being held this weekend in Trinidad and Tobago. It wasn't immediately clear Friday evening what words were exchanged between the two leaders, but photos released by the Venezuelan government show Obama clasping Chavez's hand and smiling broadly. Apparently a handshake and a smile wasn't enough for Hugo Chavez. The Venezuelan strongman followed up a brief encounter Friday with President Obama by apparently trying Saturday at a regional summit to recruit Obama into his book club. 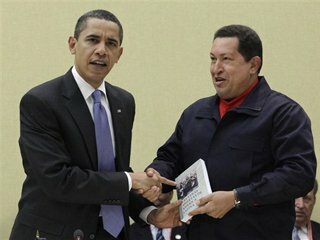 In front of photographers, Chavez gave Obama a copy of "The Open Veins of Latin America: Five Centuries of the Pillage of a Continent," a book by Eduardo Galeano, which chronicles U.S. and European economic and political interference in the region. The exchange, on the first full day of meetings at Summit of the Americas on the two-island nation of Trinidad and Tobago, followed a brief grip-and-grin encounter the previous evening, when Obama greeted Chavez in Spanish. Obama exchanged handshakes and pats on the back with Chavez, who once likened President George W. Bush to the devil. At his first meeting with South American leaders, Obama waited several minutes while security officers and members of the media pushed noisily into the room. Somebody accidentally hit a light switch, prompting Obama to ask: "Who turned off the lights, guys?" He said he hoped events would go more smoothly during the meeting where he said he would talk to the leaders about energy, security and other topics. "I have a lot to learn and I'm very much looking forward to listening," the president said. "We have at times been disengaged, and at times we sought to dictate our terms," Obama said to loud applause. "But I pledge to you that we seek an equal partnership. There is no senior partner and junior partner in our relations." He also extended a hand to a leader Ronald Reagan spent years trying to drive from power: Nicaragua's Daniel Ortega. The Sandinista president stepped up and introduced himself, U.S. officials reported. But perhaps the biggest applause line was his call for a fresh start in relations between Washington and Havana. "I know there's a longer journey that must be traveled to overcome decades of mistrust, but there are critical steps we can take toward a new day," he said. Can you imagine what our country is going to be like in 4 years? How infuriatingly degrading for the citizens of this country - someone should tell King Hussein that he’s actually our representative LEADER. And he just shook hands with a man who says we are the evil of the world and have to be brought down. Well - on second thought I guess that may be why he did shake is hand? We’ve come a long way since Reagan’s evil empire speech. What does this picture say to dissidents in Venezuela? But Mr Strauss-Kahn at least has resources fit for his own task. He will need them. The IMF is already bailing out Pakistan, Iceland, Latvia, Hungary, Ukraine, Belarus, Serbia, Bosnia and Romania. This week Mexico became the first G20 state to ask for help. It has secured a precautionary credit line of $47bn. Anyone else think Barack Hussein Obama is reading how to be the anti-Christ????? He can try but he’ll never make it. He’s too much of a bungler to be the Antichrist. And also the anti-Christ is supposed to be well lilked by everyone, and I can't stand him. LOL True, he makes my blood boil and my skin crawl. Just doing my part to keep the stupid pro Obama magazines from selling. "Give me control of a nation's [the world's] money supply, and I care not who makes the laws." 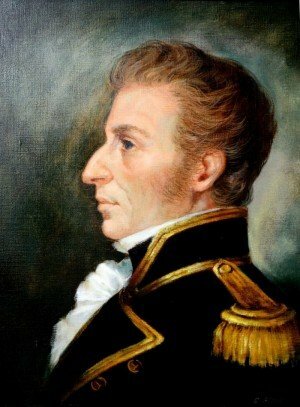 If people that voted for Obama would read and study about the history of this family (and it's branches), and it's unrelenting, cancerous power over not only western currency but key areas of commerce, they might have a clue as to how history is about to repeat itself once again....with vengeance. And that includes how it has affected US history as well.